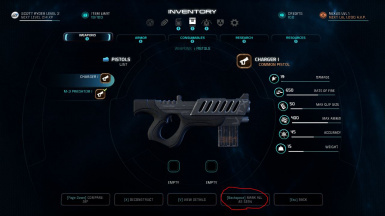 Tweaks the 'Mark All As Read' button in the Journal, Codex and Inventory so that it is always visible. Also removes the 1 second selection delay in marking an item as 'read' or 'seen'. Helps with clearing annoying broken exclamation notification icons. Frosty Mod Manager Mod made using current version V1.0.4.2 - haven't checked compatibility with older versions but should work. This is more of a hack than a fix. 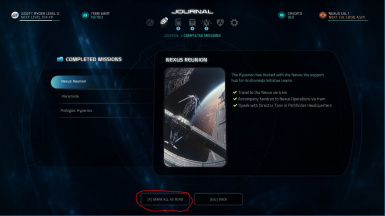 It forces the 'Mark All As Read' button in the Journal, Codex and Inventory to stay visible at all times. It also removes the 1 second selection delay before marking an item as 'read' or 'seen'. The core problem is that the game will occasionally show an update in one of these three menus which is either broken or invisible and the user will have no way of clearing them. This workaround fixes that by giving the user access to this button at all times so that they can force the game to clear them out. 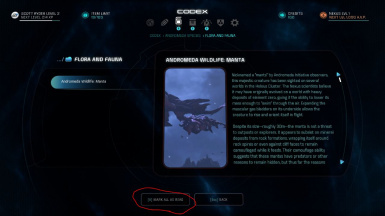 For example, the journal and codex do not show exclamation marks for entries which are 'updated' even though the game registers them and therefore the menus at the top and the main menu will flag an exclamation mark, leaving the user to have to manually scroll through each entry until they find the 'updated' entry. This works by ensuring the button is available from the start and disables events which deactivate it. Haven't tested all scenarios, particularly for 'broken' exclamation icons, but should work.